You know I am a mostly-neutrals woman who occasionally dips her toes into color. And when I do, it’s usually some shade of blue (daring!). 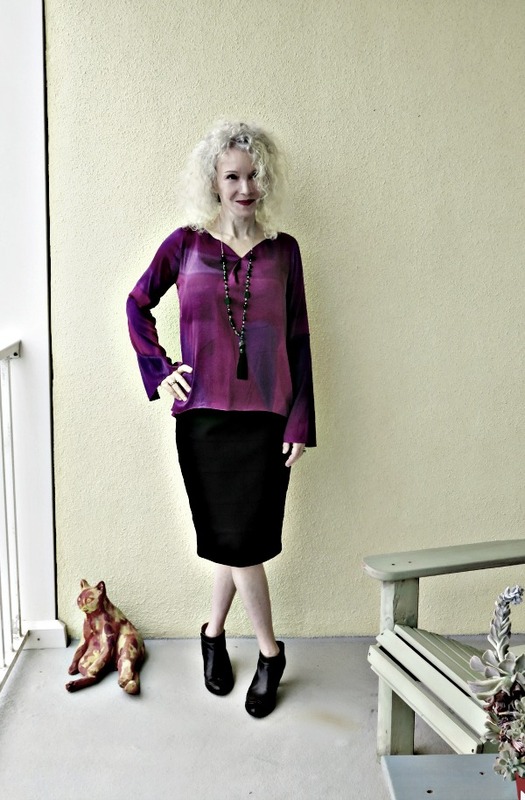 So when I saw the vibrant fuchsia silk top at the Molly Mutt Thrift, I decided to take a chance. And I do think the shade is a gorgeous one, but it makes my naturally pink complexion pinker. The top is by Elie Tahari (similar) and has a wonderful ombre pattern. the pencil skirt (sim) is ancient, but well-loved. Old booties, too by Sofft (sim). And a fabulous hand-crafted black tassel necklace by Suzanne Carillo. Ceramic kitty has a great ocean view. Even with a darker filter, the deep pink really stands out. Gorgeous top, Patti! Love the slight bell sleeve and the addition of the fabulous tassel necklace. As for the top’s color, as others have said, you look stunning in fuchsia! Oh, wow, that pink is really gorgeous on you, Patti! I have had a few Elie Tahari pieces over the years and they are wonderful quality. I’m not featuring a bright this week; tiger-stripe is a neutral, right? Thank you so much for hosting! Oh Patti—It’s just marvelous on you. Maybe it’s a good thing to have more pink in your complexion? Wonderful top, fabulous colors, you look great in this color. Perfect for Florida fall. I’m definitely more of a neutrals person too. But I do enjoy a pop of color now and then! Your ombre top is really pretty! Pretty top and I think it looks great with your complexion. Patti, for some reason, your Visible Monday button won’t work on my WordPress blog. oh sorry, Maggie – I will look into it! I love this shade on you Patti!, Great find and wear more magenta! Love it with the black booties! I think it is the perfect color for your skin tone! I would really like to say thanks very much for that job you have made in wrtiing this post. I am hoping the same perfect work from you down the road also. OMG!!!! I love this series and this book. The story line is amazing and very meticulous. I love how it all fits together…I can’t wait for the next one…when can I expect to see the next one? With your beautiful pale skin you look wonderful in those colours! More please…. I love fuchsia. Cannot really see whether it suits you too, but hey.. I sometimes buy clothes from a colour which isn’t me either. Still love them. And I can see why you love this top. Gorgeous top! The color looks beautiful on you and with black. Your necklace is a fabulous piece, too. Glad to be back after a month break from the blog. So gorgeous, Patti! I love the color and it stands out so beautifully against the black skirt. The tassel necklace is perfection, too! And I love ceramic kitty! I have one, too, who also sometimes makes blog appearances! That is one beautiful top…and I think the color is outstanding on you! So pretty! I have a pink complexion, but for some reason I feel like pale peachy pink looks flattering on me. Color can be tricky sometimes. Love this color on you!!! Great top, love both the colour and style on you. Thank you for hosting Visible Monday. That top is gorgeous. Such a rich color! I love Tahari–I had many suits from there, and even an evening dress, back in the day. Sigh! You look amazing, love the top. I also love mix and matching colourful ensembles. Beautiful blouse! I like the blend of colours and the sleeves are so pretty! That’s a beautiful top, Patti! The color, the pattern & the sleeves are fabulous! You look amazing! Bell sleeves! My favourite. I love these colours and it looks fabulous on you. Pink is vibrant and healthy. Suzanne’s necklace looks great with it too. Thanks for the party, Patti. Love that top, Patti! I am a big fan of ombre and those colors are gorgeous! I adore that colour on you! You need more super saturated colours. I think it is wonderful next to your skin. The whole outfit is super chic. Lovely outfit and you look fabulous in that gorgeous color. Thanks for the link up and I hope you’re having a wonderful weekend. Oh my gosh, I luv that top. The color is absolutely fabulous on you. What are you talking about the wrong color for you, girl?! It’s stupendous. Get more hot colors now. I am loving the new shape sleeve and this looks great on you Patti. Great Top and color, Patti! And thanks for the link up! You can’t go wrong with such a lovely shade of colour! Maybe you just need to get used to it. My skin is ‘pinkish’, too, and both red and pink suit me, just not very pale (or yellow) shades. colgiatunatrons, the book looks very fab, can't wait to buy a copy! it must be such a great feeling to be able to dance around in excitement AND tell the world. My all time favorite is “karaniwang tao”. The resopnsibility of every man especially ordinary man has been stressed here. That I guess struck me most since this song reminded us on the role we should have on our environment. I’ve been looking for the perfect piece of art to display on my fireplace wall. Since I’m a quilter, I would love to have a quilt square to place there. Thanks for the opportunity. Love ‘em. Thank you for hosting, enjoy your week! Patti oh my gosh I love love this vibrant ombre top. Love this pink color on you so much and the cut is pefect on you.